In addition to being active throughout the year sampling the Delaware River and analyzing data for its various water quality programs, Delaware River Basin Commission staff periodically assist with monitoring efforts led by partner agencies or basin cooperatives. 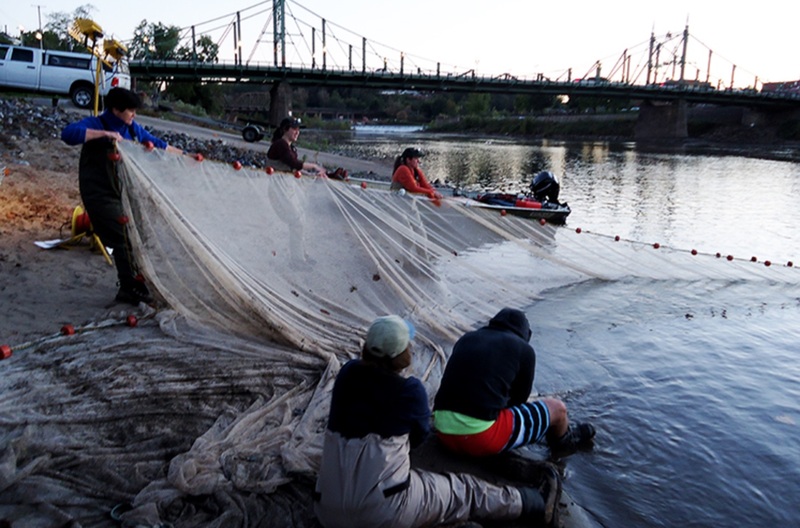 Commission staff once again helped basin state and federal fisheries biologists during the late summer and fall by providing manpower and expertise to count numbers of juvenile American shad in the non-tidal Delaware River. American shad, a member of the herring family, are anadromous fish, meaning they are born in fresh water, live for several years as adults in the ocean, and return to their natal waters (where they're born) to spawn (lay their eggs) in the spring. Juvenile American shad, called young of year (YOY), are those that are born in the spring and spend their first summer in the river. As the water temperatures cool, they travel south to overwinter in the warmer waters of the Delaware Estuary and Bay before heading out to the Atlantic Ocean. To help determine how well the fishery is doing each year, YOY shad numbers are monitored in the non-tidal Delaware as they travel downriver towards the estuary. The shad are collected by seining, using a large net to catch the fish in the river. Other fish species are also caught, and the fisheries team must then sort and identify which are YOY shad so their numbers can be recorded. In August, September, and October 2017, six different sites - Trenton, N.J., Phillipsburg, N.J., Delaware Water Gap, Pa., Milford Beach, Pa., Skinner’s Falls (Milanville, Pa.), and Fireman's Launch (East Branch Delaware River) - were monitored once monthly, for a total of 18 data points. The data collected from these surveys support an approved management plan that is in place to ensure that the fishery remains viable and sustainable. The YOY surveys are organized by the Delaware River Basin Fish and Wildlife Management Cooperative (Co-Op), made up of fisheries representatives from the Delaware Division of Fish and Wildlife, N.J. Division of Fish and Wildlife, New York State Division of Fish, Wildlife, and Marine Resources, Pennsylvania Fish and Boat Commission, U.S. Fish and Wildlife Service, and the National Marine Fisheries Service. DRBC is a liaison member to the Co-Op. Other supporting agencies include the National Park Service, the Philadelphia Water Department, and the Nature Conservancy. In 2017, DRBC staff participated in this voluntary and cooperative survey effort five times at three different locations: in August at Phillipsburg, N.J., in September at Trenton, N.J. and Phillipsburg, N.J., and in October at Phillipsburg, N.J. and Milford, Pa. Staff helped seine, sort, and count the numbers of YOY shad collected. In advance of the October sampling event at Phillipsburg, DRBC reached out to the offices of several local legislators and officials to invite them to participate. We were pleased to have N.J. State Senator Michael Doherty (Legislative District 23)’s Chief of Staff Patti Boynton and the Mayor of Phillipsburg Stephen R. Ellis join DRBC staff and the other volunteers at the Phillipsburg boat ramp. Inviting government officials to participate in these types of events helps further develop our working relationships, as well as educate them on DRBC and the river. DRBC staff work hard to fulfill the commission’s mission of managing and protecting the basin’s water resources. Being able to partner with other agencies on their monitoring efforts and use these opportunities to teach others about DRBC and what we do, are also important parts of that mission. For more information on programs, initiatives and upcoming events, visit the Delaware River Basin Commission website. Follow them on Twitter and Flickr.